About 20 minutes into “The Leisure Seeker”, Ella (Helen Mirren) almost-tearfully declares the aforementioned statement to her husband, John (Donald Sutherland). Now, John did not physically disappear from Ella’s sight and then reappear, but his mind did. John, a retired history teacher, suffers from Alzheimer’s, and although his condition does not currently and completely debilitate him (and his relationship with Ella), his sporadic fades obviously create serious problems. Ella and John decide to set aside their problems and take a road trip from Massachusetts to Key West in their 1975 Winnebago, affectionately named The Leisure Seeker in Italian director Paolo Virzi’s (“Human Capital” (2013)) first American film. 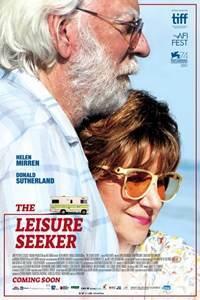 Although the picture does wrap itself in familiar road trip storylines, led by two strong performances from two very likable acting-legends, “The Leisure Seeker” resonates with humor, nuance and angst over the course of 1 hour and 52 minutes. The screenplay – co-written by Virzi and three others – has Ella and John spending their minutes, hours and days in an RV that captured decades of fond memories for the two, while they reminisce about their marriage, their loving family and the good old days on their way to Florida. At least they attempt to remember, but John falls into distressing traps because of his condition. This frustrates Ella, and even though they enjoy a strong marriage, their 40-plus years of cohabitation have not been completely full of bliss. Ella frequently loses her patience with John, while his lapses double the angst for the audience. First, the couple’s sunny, positive vibes suddenly become stymied, because Ella needs to stop and grapple with John’s disorientation or fleeting memory, whether in a restaurant when he repeats and repeats his hunger for a burger or wonders where their little children are. Meanwhile, their kids, Jane (Janel Moloney) and Will (Christian McKay), are 40-something adults. Second, Ella simply wishes for a pleasant drive down the east coast free of incident, free of reminders of their advancing ages and the freedom to just embrace the moment, but her frustration tends to boil over into snipes and gripes. It certainly is easy for a movie audience to have sympathy for John, but Ella bears the burden of knowing decades of better times, while also coping with a completely separate issue of her own. Her outbursts certainly ring with understanding, even if they do bruise our eardrums. Ella’s and John’s emotional beats should resonate for most, as this couple could be any elderly couple from Anywhere, U.S.A. Mirren, Sutherland and Virzi create a relatable environment within the confines of The Leisure Seeker and every step outside it. The three take great care in embracing the pair’s history through a specific and wonderful routine that Ella and John enjoy at every campground during their 1,600-mile journey. It’s funny, because their particular evening practice (which will not be revealed in this review) can be a painful one for friends and relatives – in our own lives - to endure, but in this case, it is very sweet and loving and gives ample chances for moviegoers to learn about these two seniors with rich histories. Accompanied by a rich, contextual soundtrack - from the 60s counterculture and the decade after – Mirren and Sutherland seem to effortlessly gel as husband and wife with a lifetime of memories. Their moments of complaint, love and anticipating the others’ tendencies flow off the screen, while they also juggle their characters’ emotional diagonals with ease. Sutherland’s work here is not as dynamic as Julianne Moore’s in 2014’s “Still Alice”, however, the narrative does not call for it. Here, this simply is a weeklong trip, so the dramatic memory loss in Moore’s performance never comes into play. Through this film’s subtle emotional touches, however, the pain of John’s loss certainly is no less heart-wrenching, and this critic certainly felt happy when John occasionally comes back to Ella too. Jeff – a member of the Phoenix Critics Circle – has penned film reviews since 2008 and graduated from ASU’s Walter Cronkite School of Journalism. 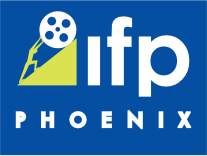 Follow Jeff and the Phoenix Film Festival on Twitter @MitchFilmCritic and @PhoenixFilmFest, respectively.